Teaching U.S. History offers an innovative approach to social studies teaching by connecting historians to real-world social studies classrooms and social studies teachers. In an unusual, even unprecedented, dialogue between scholars and practitioners, this book weds historical theory and practice with social studies pedagogy. Seven chapters are organized around key US History eras and events from the time of slavery through the Civil Rights Movement and are complemented by detailed discussions of a particular methodological approach, including primary source analysis, oral history and more. 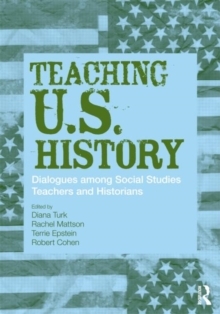 Interviews with historians open each chapter to bring the reader into important conversations about the most cutting edge issues in U.S. history today and are followed by essays from expert teachers on the rewards and challenges of implementing these topics in the classroom. Each chapter also includes a wealth of practical resources including suggested key documents or artifacts; a lesson plan for middle school and another suitable for high school; and suggested readings and questions for further study. Teaching U.S. History is a must read for any aspiring or current teacher who wants to think critically about how to teach U.S. history and make historical discussions come alive in the school classrooms where the nation's students learn.